With the official launch of Yamaha’s funky new single, the MT-03, this week we thought we’d offer you so cheaper alternatives from our Bikes for Sale section. Click the links below to check out some of the great bargains available on motorcyclenews.com or click here to search for exactly what you’re looking for. Click here to sell to the biggest audience in biking. This Kawasaki KLE500 has only done 1786 miles but is up for the amazing price of just £2795. 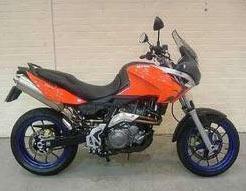 This 2005 Aprilia Pegaso 650 has done 1500 miles and is up for £4495. For just £3599 you can have this BMW F650 Funduro with 13790 miles on the clock. Honda’s new FMX650 can be had for £3895 with just 1116 miles. Or you can go down the budget route with this 10,000 mile Cagiva Canyon 600 for £2450. Or try our new auctions section to sell off kit you no longer need, or bid for something new. Find out the real value of the bike you're looking at or decide how much you should sell yours for on the new Parker’s used bike price guide.